I have tried just about all of the online booking sites and have had a varying degree of satisfaction and dissatisfaction with them when it comes to booking accommodation for the family. It can do your head in comparing the different sites and even if you go to a one stop shop search engine like hotelscombined.com, they still do not list all the properties because of the complex commission arrangement these providers have with accommodation providers. I mostly use booking.com as their prices are always competitive and seem to have more listings worldwide than other sites. Priceline.com is a subsidiary of this company and I did experience a problem when I went to book for a family of 4 and the coupon comes back as only 2 people. After contacting the accommodation provider I had to pay extra. In this case it wasn’t much extra, but the provider did contact priceline.com and they said they’d fix this issue. The same can’t be said when I had the exact same problem with agoda.com. I used them in the past when booking 2 rooms for the 2 kids and us, so I didn’t hesitate to use them again. However, the story becomes very different to booking family rooms or apartments. Once again I booked for 4 people and the coupon comes back for only 2 people. After contacting the accommodation provider, they said I’d have to pay more and this time it was hundreds of dollars over 3 days. Unfortunately, the booking was nonrefundable and they were not interested in my sob story . The moral of the story is also to pay extra to have your bookings fully refundable if plans change or you get delayed by airlines, trains etc. My complaints to Agoda.com about how their website was misleading when booking for 4 people also fell on deaf ears. They did offer me a USD$35 credit which I could only use where I didn’t have the pay the accommodation provider direct. These type of bookings on a trip to South Africa were rare and even if they weren’t, do you think I could trust them with another booking for 4 people only to have the same thing happen? I will never use them again. Always check direct with the hotel’s website as the rate may even sometimes be cheaper than the booking site. I have had nothing but positive and fantastic experiences with Airbnb. Make sure you do your research. What are are the reviews like? If there are none, then don’t book it no matter how tempting it may be. Is it in a easy location? What’s their communication like with any questions you have? They can be expensive and cheap and you may get value for money and you may not. A fantastic saving for those on a budget. In fact, get AUD$50 off your first stay by clicking here. The accommodation needs to be $100 or more so make sure you read the fine print. I took advantage of this and was able to spend that money on a nice meal for the family and I didn’t have to cook! You can also browse, add trips and save places to your favourites. 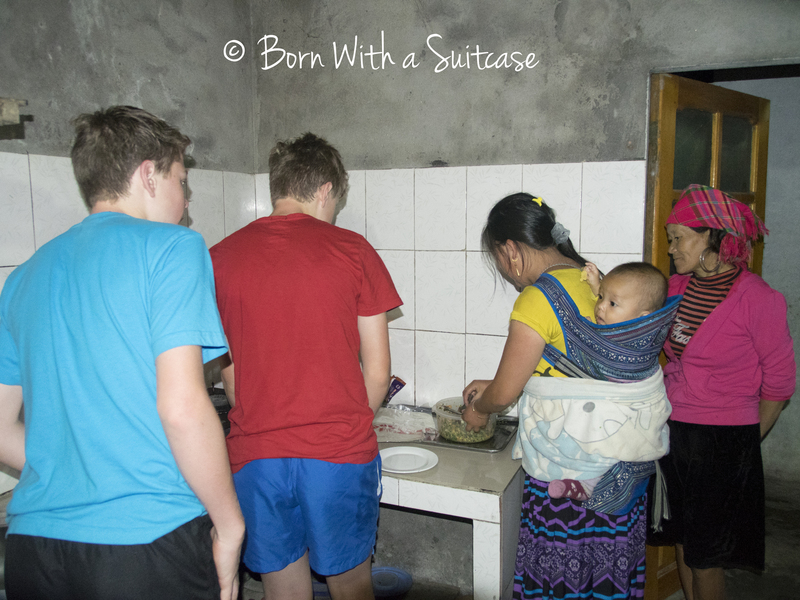 Why not consider a home stay with a local family in countries that aren’t 1st world. It’s a wonderful way to experience the local culture through your host’s hospitality and local knowledge. Live like a local even if it is only for a few days. It also gives back to a community by offering a local person an income and provide for their families. Not every country offers it but do a little research and find the ones that do. We did a home stay in Vietnam and it was an absolute highlight of our trip. Homestay.com is a great way to start planning your local adventure! This can be an amazing way to immerse yourself into the local culture of a place if you want to stay longer term for very little cost. I haven’t been a house sitter or done an exchange before. However, I have used a house sitter to look after our home and beloved pets whilst on holiday. It was a positive experience and I would recommend it to anyone. You will need to check mail, andtake care of any pets and perhaps maintain a garden. A small price to pay for a cheap holiday! Also a win win situation with the owners getting piece of mind while they are away. Always do your due diligence though, make sure you ring up references and look at reviews, ensure they have a comprehensive manual written up so you are not left in the lurch if an emergency pops up. Each country has their own local sites and there is nothing stopping overseas visitors from joining to find your perfect match. In Australia I can recommend using Aussie House Sitters in Australia, and Trusted House Sitters for international sitting (UK, USA, Canada, France, Australia and New Zealand) . Exchanges are a bit different in that you directly swap house with another person. They are bit more work logistically but some swear by it.